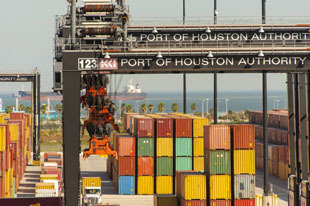 The 1,100 miles of existing highways that make up the I-69 Texas System route today serve as critical connectors to the deepwater ports at Houston, Galveston, Beaumont, Freeport, Point Comfort, Corpus Christi and Brownsville. 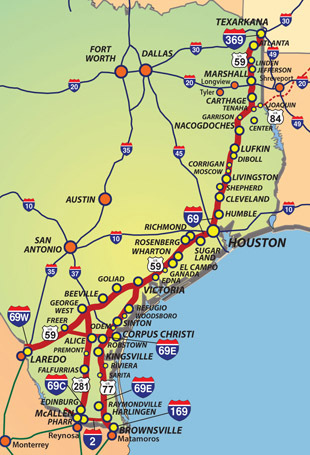 Each completed Interstate 69 upgrade project extends the market reach of all Texas seaports which are vital engines of the Texas economy. Sections of highway continue to be added to the Interstate Highway System as part of I-69. There are still more miles of highway along the I-69 route that are at freeway standard or near that level. More sections will be added to the system as they are evaluated and as projects are completed that provide the required controlled access, free flow and safety features that are the hallmark of interstate highways.